Today we will start the class with two more videos. You'll learn the difference between the World Wide Web and the Internet and then about HTML. Then you should finish editing your Ancient Rome Powtoon and posted it on your website (using the embed code). Today we will start to wrap up the year and review how the Internet and Websites work and talk a little bit about HTML. We'll watch a movie called "There and back again: a packets tale", "How websites work", "HTML tutorial: What is HTML?". Then I'll show you how to "embed code" from other applications into your website and then give you a chance to try it. Students who have not finished the Ancient Rome project will get a chance to finish it. Copy & paste the code into the HTML of your web page (or MySpace/Friendster profile page). Make a scrolling banner for your website! Today we are going to look at how search engines work. Below are two search engines I'd like you to start with when you do your research. Only use Google search engine and YouTube search if you cannot find what you are looking for in one of the recommended resources. Our Web site invites broad participation in a new kind of wiki system, guided by teachers. 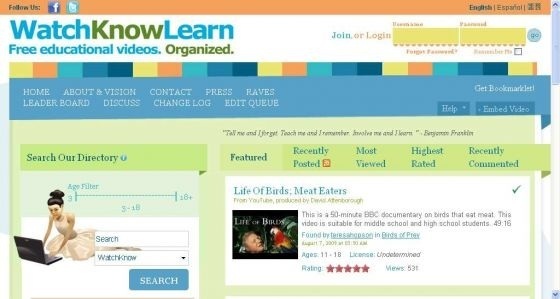 WatchKnowLearn does not itself host videos—we serve as a library for links to excellent educational videos that have been selected by educators. We are going to try something different. The students have been learning about Ancient Rome for the past three weeks. Mrs. Wagner and I want the students to pick out something they are personally interested in (about Ancient Rome) and think of a question they have on the topic. They should do research to find the answer. While they are researching the first question, they should be thinking about what other questions they have based on their new found knowledge. It can be directly related or indirectly related. Here's an example. Let's say I'm interested in Ancient Roman aqueducts. I might have a question: "where is the source of the water for the aqueducts that fed water to Rome?" While I'm getting the answer to that question, I might ask "How did they build the aqueducts?" Which might lead to the question "How did they get through the hills and valleys?" Which might lead to the question "How does water pressure work?" A final question might be "Where else do we use water pressure in modern times?" Click here for general ref sites. Click here for Ancient Roman ref sites. Today you are going to learn how to use a new presentation tool called Powtoon. I'd like you to write something you admire about 5 people in your life (friends, classmates, or family members). Create one slide per person. Don't forget to include a cover slide. Try to experiment with as many features of Powtoon as possible. The point of this exercise is to learn the tool. Click on the Powtoon image to create your account. I will give you your Powtoon code. Click here to create our account. Now that you have finished taking notes on your Ancient Greek landmark, you should be writing your stories in writing class. 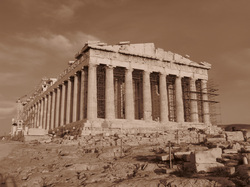 Today in computer class you will be looking for a photo of your Ancient Greek landmark and taking a green screen photo(s). Next week you'll superimpose yourself into your photo. Here are some sites you can use to find a photo. I like these two sites because it is easy to find a "public domain" or "creative commons" photo. Remember to download the "full size" image and put it in your personal folder. Don't forget to give credit for using the photo. You can save the information in a Microsoft Word document. Wikimedia Commons usually provide you with the attribution information. You should copy and paste the information into a MS Word file. If you use compfight, remember to click on "creative commons" on the left hand side. 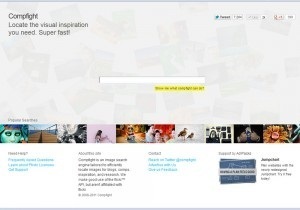 Once you select and download your image, move it into your personal folder. You can copy the embed code for the source information and save it into a MS Word file. Each of you has selected an ancient Greek site to research. Mrs. Wagner has given you a note-taking sheet for this project. Today you will start to do research on your site. The final project will be a story of how you were transported through time to your historic site. You will use the information from your research to make the story realistic. You will also include a photo of yourself at the site using Paint.NET. Click here to start researching. Today I will meet with each half of the class for half a period. Everyone did a fantastic job on their Chroma Key photos. I would like everyone to post their Chroma Key photos to their website. You should create a new page on your website, post the photo you created, and write a brief description to go along with it. Tip #1: Select background images that are 1024 x 768 minimum recommended resolution for 4x6 (if it's less, you may find your images pixilated. Tip # 2: You can add more than one layer to a photo. If you want to add accessories, make sure you find an image that has a transparent background (PNG). Tip #3: I have the best luck by opening the background first and then adding Layers (Import From File). Once you have finished removing the background to your photo, save it as a PNG file. Then close the file. Now open the background image that you've saved in your personal folder. Under "Layer" click on "Import from File" and import your PNG image. When you are done, save a copy as a PDN file. This file will save the "project", so you can continue to play with it. Then save a PNG or JPG version. Say yes to "flatter". This will fuse the layers together as a final photo. You will not be able to edit the different layers again of this image.